Hi lovelies! 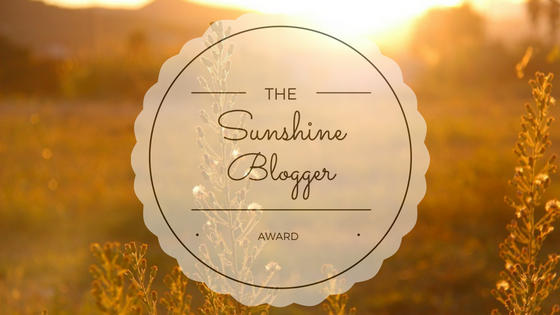 I was nominated for the Sunshine Blogger Award, so todays post will be answering those questions. Thank you so much to Olivia Charlotte from oliviacharlottesite.wordpress.com for nominating me, if you haven't seen her post then check it out here. This award is for bloggers that are inspiring, creative and positive so I feel so lucky and thankful to have been nominated for this award, so lets get on to the questions. Nominate other blogs and give them new questions to answer. 1.Where do you get your positivity from? I would have to say my mum, she has always been a positive person and taught me to always look for the positive in things. 2. What is your favourite makeup item? Has to be highlighter. I never used to like it before but once I found one that was perfect for my skin tone, I was in love!! I have so many highlighters it's bad lol! 3. Who, out of everyone who’s ever lived, would you most like to have a chat with? This is such a tough question, I had to spend a whole night thinking about it and honestly, I couldn't come up with an answer. There are many people I would like to have a chat with, especially Sigmund Freud as I study psychology and he is a popular psychologist. I would like to talk to him about how psychology has developed in the modern day and age. My favourite thing about blogging has to be all of the lovely fellow bloggers that I have met. The whole blogging community is fantastic and everyone is so supportive of each other. 5. What is your favourite makeup look? I would have to say something bronze/gold as that is always a winner with me. I always find that those colours suit me best and you can create the look all year round. However, I also love the autumn colours such as red, oranges and burgandy so that is a tough one. 6. What would be your dream place to live? I would love to live by the beach as I love the sound of the sea. I would also say a city as i'm a city girl at heart so a combination of the two would be good. 7. Is there anything you don't like/want to improve about your blog? Yes, there is. I started my blog only wanting to write about beauty but now I have enjoyed writing about lifestyle posts, such as university, trips and days outs. So I would like to try and write more of those posts so my blog isn't just beauty related. 8. What's your opinion on glitter makeup? I think glitter makeup is awesome, but it just isn't for me. I would just end up making a complete mess and ruining my makeup haha! But I love seeing pictures of people with glitter makeup and I have to admit that I do get jealous of their skills. 9. Do you have a favourite YouTuber? I like a lot of YouTubers. I watch YouTube religiously and I have to admit that I got most of my makeup skills from watching videos. I love Casey Holmes as she suffers from rosacea and has sensitive skin, so I love watching her videos because we have the same skin type and she loves reviewing drugstore makeup which makes it a little easier on my bank account haha! 10. What can cheer you up after a bad day? Definitely coming home, having a cup of tea and a chat with my mum. I also love getting into a bath and just relaxing and trying to forget about the rubbish day I had. What is your favourite thing about autumn/fall? What was the last book you read and what was it about? Is there a food you could not live without? What gives you your inspiration for blog posts? Which one of your personality traits do you wish others had also?